Home >> A Books >> Celebrate Geography Awareness Week With Three New Titles! Celebrate Geography Awareness Week With Three New Titles! November 14-20 has been designated Geography Awareness Week, so this week Education World reviews three new titles with geography themes. Geography Awareness Week is coming up -- the perfect time to focus our BOOKS IN EDUCATION reviews on books with geography themes. Any one of the three books noted below would make an excellent addition to geo-learning! One of the best new books of the past year is from Henry Holt. Education World did a mini-review of The Scrambled States of America last summer, but this book is so special and so much fun that it's worth mentioning again! See Summer Book-Tivities #5 for the mini-review and an accompanying "Find the 50 States" word search puzzle. "All day long we just sit here in the middle of the country," a grumpy and bored Kansas complains to neighboring Nebraska. "We never GO anywhere. We never DO anything, and we NEVER meet any NEW states!" Kansas's grousing sets the wheels in motion! Together, Kansas and Nebraska pull off a huge wingding for all 50 states. The partying, dancing, laughing, and singing go on for hours -- until late in the evening, when Idaho takes center stage. Idaho and Virginia had just been talking. "We thought it might be fun if she and I switched places - you know - so we could see another part of the country," explained Idaho. A wave of excitement swept the room. By late the next day, each state was settling into a new spot on the map. "Oh yes, this was a much better arrangement!" the states agreed unanimously. Soon, however, reality settled in. Alaska was getting tired of being poked in the side by Oklahoma's handle. Minnesota got sunburned in Florida's place. And Kansas ("Aloha, world!") is lonely and seasick in the middle of the Pacific. Everybody seems to realize (as Dorothy did in Oz) that there's no place like home. The states resume their former spots, and relief settles in across the country. Laurie Keller has created a real treat in The Scrambled States of America. Few books combine fact and fiction with such a fun result! The dialog between the states is hilarious! Kids will learn about the states, geographic features, landmarks, and more, while reading the witty repartee. Nevada and Mississippi fall in love, so Nevada pops the question ("Do you want to become Mrs.issippi?") Wisconsin offers California some cheese. ("Eeeooo! Get it away! I'm lactose intolerant!") The Great Lakes finally meet the Great Salt Lake and an exchange of mutual admiration ensues. ("You're great!" "No, you're great!" And so on) Seattle's famed Space Needle wonders how the St. Louis Gateway Arch can bend over as it does. The wisecracks and clever humor fly! The Scrambled States of America is great fun and great learning -- no matter what state you're in! At the time of Columbus's voyages, many people thought the world was flat. From their perspective it was difficult to imagine any other possibility. In Lizard Sees the World (Clarion Books), Lizard thinks the world is a bowl. From his perspective it couldn't be any other way. He lives in the bottom of the bowl and he wants to travel to the edge -- where the land meets the sky -- so he can look down and see the whole world spread out below him. The other lizards can't imagine why Lizard wishes to travel to the edge of the world. They'd rather lay in the sun and nibble on insects. But Lizard follows his dream. And along the way he meets Trout and Rabbit and Hummingbird and Snake. Each animal has its own unique perspective on the world, but none of them share Lizard's desire to know what the outside world is like. Only Eagle knows the truth. Eagle laughs when Lizard tells him that he's going to the edge of the world. Lizard climbs and climbs up the canyon where he lives until he gets to the edge. There he learns the truth. The world is not a bowl. He lives in the bottom of a deep bowl, but the real world doesn't end there. It spreads out in all directions beyond. Now Lizard understands why Eagle laughed. Susan Tews sets Lizard's story in the Grand Canyon. Her simple tale is illustrated with humor by George Crespo. His oil paintings, in vivid yellows and greens set against a blue sky, capture the wonder of Lizard's exploration. Lizard Sees the World would be a terrific resource for any teacher to use at the start of a geography unit. Just as Lizard's eyes are opened to the possibilities of what lies outside his home, so teachers can use Lizard's story to get kids to think beyond their own neighborhoods. A new book from author Margery Cuyler helps young geographers understand their place in the universe. In From Here to There, Cuyler introduces Maria Mendoza. Maria lives with other members of her family -- her mother and father, brother, and sister -- at number 43 Juniper Street. The opening spreads of the book establish Maria's place in a loving family. Each successive spread pulls back a bit in perspective. Little by little, Maria's world widens as Cuyler places her in the town of Splendora, in Liberty County, in the state of Texas, in the United States, in North America, in the Western Hemisphere, on the planet Earth, in the solar system, that is part of the Milky Way galaxy, in the universe. But no matter how far from home, no matter how wide the world or how vast the universe, Maria is still Maria, an important member of the Mendoza family. Primary grade teachers will appreciate Cuyler's simple text. With few words, children will see clearly their place in the vast world that surrounds them. The bright watercolor and pastel illustrations by Yu Cha Pak put Maria's place in the world in perspective and set From Here to There apart from other books that have attempted to tackle this concept. The classroom follow-up activities are as clear as the text. Students will eagerly create their own From Here to There books after reading Maria's story! The three books highlighted in this week's Education World BOOKS IN EDUCATION story are available in bookstores everywhere. If you are unable to locate a copy of the book you want, ask your bookseller to order it for you or contact the publisher directly. 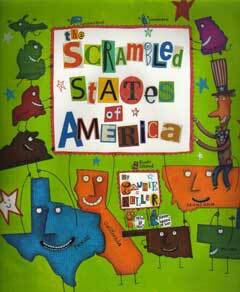 The Scrambled States of America, written and illustrated by Laurie Keller, is published by Henry Holt and Company, 115 West 18th Street, New York, NY 10011. 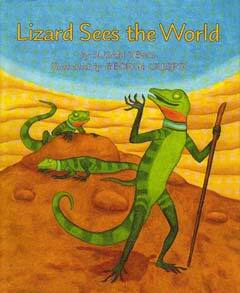 Lizard Sees the World, written by Susan Tews and illustrated by George Crespo, is published by Clarion Books (a Houghton Mifflin imprint), 215 Park Avenue South, New York, NY 10003. 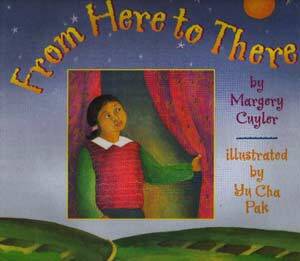 From Here to There, written by Margery Cuyler and illustrated by Yu Cha Pak, is published by Henry Holt and Company, 115 West 18th Street, New York, NY 10011. "Explore the World! Geography Takes You Places"
Celebrate the 100th Day in 100 Ways! A Dozen Articles Every Educator Should Read! TIME 100: The Teaching Resource of the Century! National Geographic Introduces Two New Atlases -- Activities Too!